The human health costs of losing antibiotics as an effective treatment for infectious disease would be enormous. President Obama recognizes this and has made combating the challenge an administration priority. The new National Action Plan for Combating Antibiotic Resistant Bacteria is ambitious and detailed in the steps the administration will take to increase stewardship of antibiotics in human health. But the action plan remains oddly cautious in tackling antibiotic use in livestock, despite the fact that American cows, pigs, and chickens consume most of the antibiotics used every year in the United States. And American farmers frequently use the drugs to promote growth and prevent disease in healthy animals—ideal conditions for drug resistant bacteria to thrive. US livestock producers have long fought restrictions on antibiotic use for fear that would reduce their profits. But there is a growing body of evidence that their concerns are overblown. Indeed, many meat suppliers are voluntarily moving away from the routine use of antibiotics because of consumer demands. The European Union banned the use of antibiotics for growth promotion in farm animals almost a decade ago and many European countries have gone further in restricting antibiotic use in livestock. 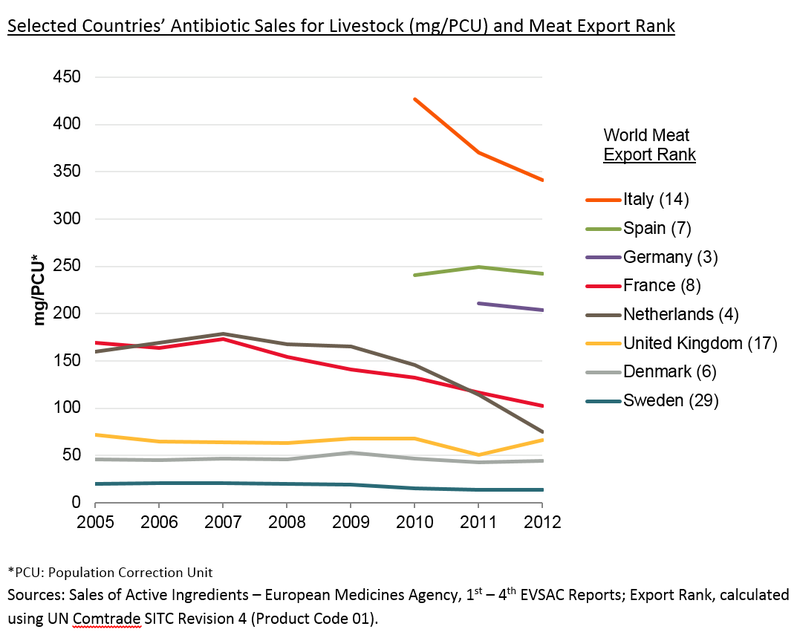 Denmark and the Netherlands have been among the most aggressive in slashing antibiotic use, yet they remain major meat exporters. Data from across European countries shows wide variation in antibiotic use and no correlation between antibiotic use and export success. Sweden was the first country to restrict antibiotic use in farm animals in 1986. It did so at the behest of livestock producers who were concerned about negative reactions from consumers to reports about the heavy use of antibiotics in animals. The Perdue poultry company is phasing out antibiotics, except for the treatment of disease, and several major chains, including McDonald’s and Chick-fil-A, are requiring their suppliers to reduce antibiotic use. At the end of 2014, the six largest US school districts—Chicago, Dallas, Los Angeles, Miami-Dade, New York City, and Orlando County—announced they would demand antibiotic-free chicken when they renew contracts with meat suppliers. Despite these movements in the market, however, the President’s new action plan does little more than affirm the voluntary policy guidance that the Food and Drug Administration issued two years ago to phase out antibiotic use for growth promotion in livestock. This is disappointing. The European experience, reviewed in my paper, shows that simply banning antibiotic growth promoters is not enough. The Danish and Dutch governments both found additional steps were necessary to ensure that antibiotic use in livestock actually declined. The administration’s action plan calls for programs to educate farmers and veterinarians about antibiotic stewardship, but it does nothing to ensure the incentives they face are aligned with the goal of reducing use. As I’ve written here and here, there are still important loopholes in the administration’s approach to reducing antibiotic use in livestock. Unfortunately, the new action plan falls short of sufficiently changing that.